"Demolition!" measures A5 or 5.75×7.5 inches. I did a quick sketch with pencil and then used a Pilot Parallel filled with a mix os Noodler's Black,Luxury Blue and Nikita ink for the darklines and color was added with watercolors and a brush. 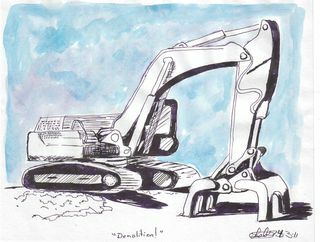 This entry was posted in Uncategorized and tagged construction, demolition, drawing, equipment, ink, sketch, watercolor on 20110404 by leslie.